The night holds many mysteries, not the least of which are its creatures. Most people live a lifetime without ever seeing a common neighbor, the flying squirrel, yet they are all about us. Both the Northern and Southern Flying Squirrels are mini versions of their daytime cousins – about half the size of a Gray Squirrel. Big-eyed because they are nocturnal, they make use of a flap of furry skin to glide – not fly – a hundred feet or more. They eat the usual squirrel foods, like nuts, seeds, insects and eggs, though the Northern is said to have a fondness for truffles and other tasty fungi. Flying squirrels were once much better known and appreciated, not as aeronautical wizards but as companions. As far back as colonial times, people caught them as babies and raised them as pets. 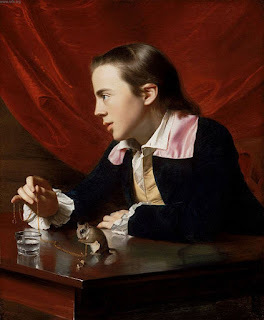 One of John Singleton Copley’s most famous paintings, “Boy with A Squirrel,” shows Copley’s half brother seated at a desk with a pet flying squirrel alongside him. All is not perfect in this man-rodent relationship, however, and flying squirrels will sometimes infest attics. A dozen or more might decide to spend the winter huddled together in the comfort of your home.